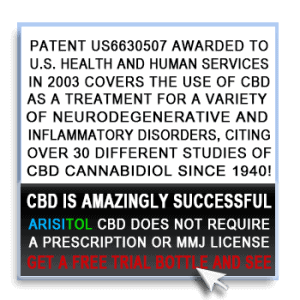 CBD Oil Review rates the Arisitol line with two stars because it qualifies for the Mission & Innovation Badges. 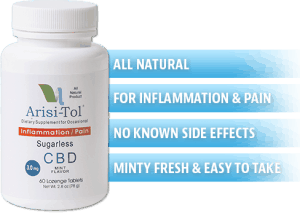 Arisitol or Arisi-Tol is an all natural dietary supplement used for occasional inflammation and pain that ranges in price from $25-$160. This sugarless CBD oil mint flavored lozenge tablets that are convenient and easy to take. Arisitol offers a free trial of sorts which makes trying this product a low financial risk because if you don’t like it after a week, you can send the rest back for a refund. The parent company Twin Falls Biotech is focused specifically on helping people with pain and inflammation issues of which there are hundreds of millions of people in the US alone suffering. 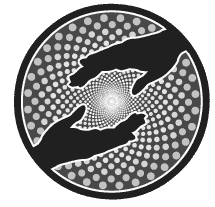 Mission Verified – The Arisitol mission is focused on helping people suffering from pain, inflammation and nausea live better lives. Innovation Verified – Arisitol has created the first ever CBD lozenge delivery system making CBD even easier to take in this new way. Quality Is Questionable – Arisitol does not share about how their CBD oil is processed or where it comes from making it questionable. Might Not Be Safe – Arisitol speaks about lab testing and even links to a page that has no lab result on it. They made an attempt but failed to deliver transparency.